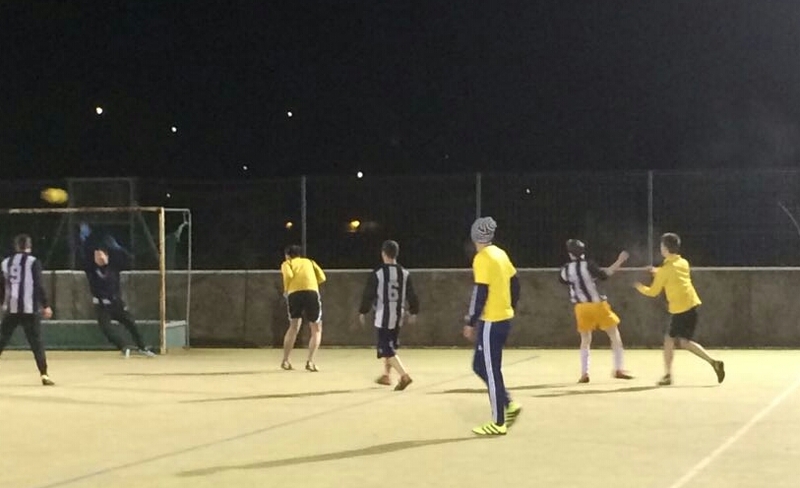 In the 8pm games Real VVV were taking on Chipping, and Carnforth were against Wray. Real VVV have been on the slide and haven’t won a game since November, after being one of the form teams up until that point. VVV had just had 2 weeks off and the rest had done them good, with a great team performance against a Chipping team that has been playing well and not getting the results that their performances deserved. Real VVV, just had too much for Chipping and their experience showed as they closed Chipping’s attacks down and were clinical when presented with chances. On paper Wray against Carnforth should have been a comfortable victory for Wray, however Carnforth had other plans. After 8 minutes Carnforth had rushed into a 3 – 0 lead with Callum Thompson turning the Wray defence inside out and finding some smart finishes. Wray have had a very settled team this season, but had a couple of changes and it took them a while to find their feet, but as the half wore on, they managed to get to grips with Carnforth and even score a couple of goals themselves. Half time came and Carnforth were still leading 3 – 2, but going into the second half Wray started with a high intensity and Harry Gorst and Mark Ellershaw in particular, started to dictate play and scored 3 quick goals themselves. Carnforth could never just find a way to get back on top and the rest of the second half was even with the final score being 7 – 5 to Wray. Good teams always find a way to win, even when not playing their best. At 9pm Dave Lawson spoke to us. It was exactly 25 years to the night that he had asked Jesus to forgive him and to give him new life. Dave was really open and honest with the lads about his life and how much he needed Jesus. But not just 25 years ago… Dave said that he needs Jesus every day to help him in the daily battles. In the late games the Capernwray Students had a couple of new players and started the game against Ingleton at a frantic pace. They were quick to every ball and didnt look like a team that should be bottom of the table. Ingleton rode the storm and with the help of a penalty and a couple of smart finishes from James Lawson, took control of the game. The students did pull a goal back with a fantastic turn past 2 men and a smart finish, but the goal of the game was about to come from Dan Hallam. A ball was played across the pitch to him at about waist height and from the centre spot he hit the sweetest of volleys past the Capernwray keeper, who it must be noted, is one of the most consistent keepers in the league, but he had no chance of saving it! The students played well right to the end of the game, but Ingleton were too strong for them and are finally looking like the team that started the season so strongly. Young Guns had beaten Capenwray Students heavily last week and this week it was the turn of Capernwray Staff to take them on. Young Guns were playing very good football before Christmas, but with the addition of Joel Law, they are now as good as anyone on their day. Unfortunately for Caperwray Staff this was one of Young Guns days! 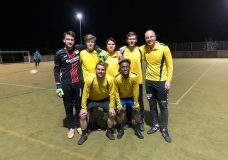 Again with a settled team and a number of their players able to interchange around the pitch, Young Guns blew the Staff team away and the final score was 11 – 1. As the 2017-18 season heads towards the last few fixtures, Wray have a firm grip on first place and will be aiming to go unbeaten right to the end. Crown Lane have a good advantage in second place but with Young Guns starting to put a run of wins together, they could need another 3 wins to claim second for the third season in a row. At the other end of the table it is tight and the bottom 4 clubs could finish in any order, with one or two targeting the teams above if they finish strongly.